Transportation to and from Goldfield improved greatly with the arrival of the railroad. 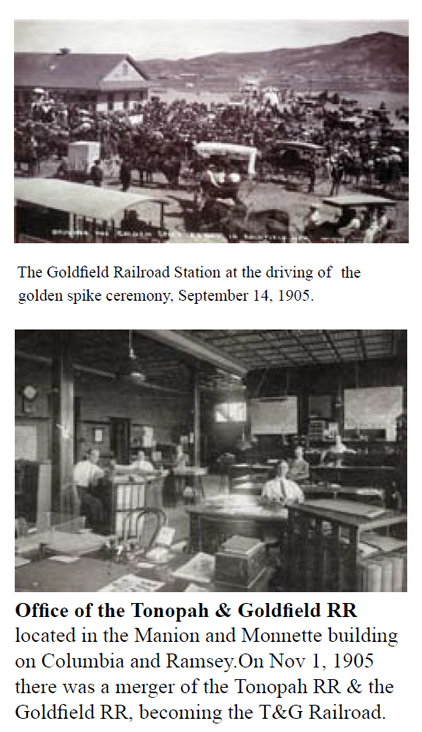 On September 12, 1905, at 12:30 p.m. the first passenger train arrived in Goldfield, greeted by 300 people. 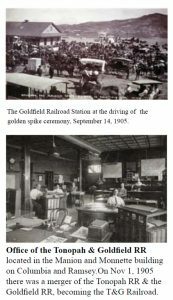 It was operated by the Goldfield Railroad Company. The arrival of the Railroad kicked off three days of celebrations, but mourning for some stage lines. In all there would be four railroads serving Goldfield, and one local line operated by the Goldfield Consolidated Milling & Transportation Company. The Tonopah and Goldfield Railroad built railroad shops and a terminal near Aluminum and Fourth Streets, in May of 1910. The T & G operated until October of 1947, and had a life span of 44 years.The Las Vegas & Tonopah Railroad was built in 1906 & 1907, from Las Vegas to Tonopah, and had stops in Beatty, Bullfrog, Rhyolite, and Goldfield. The LV & T ran for 14 years, until October 31. 1918, when the Nevada Department of Highways purchased the railroad right-of-way for Highway 95. The Tonopah & Tidewater Railroad was built starting in November 1905, and completed October 30. 1907. It ran from Ludlow, California northward via Death Valley Junction to Gold Center, just two miles south of Beatty, and then northward on the Bullfrog Goldfield Railroad. The T & T Railroad ran until June 14, 1940, a span of 33 years. The Bullfrog Goldfield Railroad was constructed starting in May 1906, probably starting at Milltown in the Goldfield Mining District, at the terminal of the T & G tracks, and was completed southward to Beatty by April, 1907. The Bullfrog Goldfield freight depot and maintenance building was situated at Fifth Avenue and Pearl Street across from the Santa Fe Saloon and is under reconstruction today. The Bullfrog Goldfield Railroad operated until January, 1928. During various stages of its existence, the BGRR leased its tracks to either the T&T or LV&T. Management changed hands five times during its 21 year life span. Railroad Day September 12, 1905. The arrival of the Railroad marked the end of the stage coach to and from Goldfield and Tonopah.